The UKCRC TDCC recently attended a workshop on the use of human tissue for safety assessment jointly hosted by the Safety Pharmacology Society (SPS), the University of Coventry and The National Centre for the 3Rs (NC3Rs). The event was a great opportunity to learn about human tissue in safety pharmacology. But what is safety pharmacology and why is human tissue important? Dr Helen Prior, SPS secretary and Programme Manager within the NC3Rs explains. What is safety pharmacology and why is it important? Safety pharmacology studies are used to investigate the potential undesirable effects of a chemical or drug in development on physiological functions in animals, at a dose relevant to human exposures. These studies satisfy a key requirement in the process of drug development, alongside other toxicology assessments, as data is required by regulatory authorities ahead of the first-in-human trials. Safety pharmacology studies are required to assess the impact of a potential new drug for human use on the vital organ systems (central nervous, respiratory and cardiovascular systems). The requirement for these studies is detailed in the International Committee for Harmonization 7A and B (ICH7A and ICH7B) guidelines which have been ratified by regulatory bodies worldwide. Data from safety pharmacology and toxicology studies using both in vitro and animal models guide clinicians in setting a safe starting dose for humans and provide information on potential adverse events to monitor during clinical testing. Due to these safeguards, human volunteers only rarely experience severe adverse effects during or after clinical trials; when severe reactions occur in human tests it is often due to off-target pharmacology which was not detected in the animal models. How can human tissue help improve safety pharmacology? Animal models are unable to detect all safety concerns due to inherent differences in the physiology and genetics between animals and humans. There is a rapidly evolving industry developing in silico and in vitro models which could be used to screen for toxicities and safety concerns ahead of and alongside the animal tests. The development of techniques to culture and analyse human tissue in all formats has continued apace, with new methods enabling this tissue to be used in a meaningful way for drug and chemical toxicity studies. The use of human tissue in these studies has the potential to increase predictivity to human and reduce our reliance on animal testing. The tissue required differs in terms of the tissue type, the source of the tissue, the method of preservation and the techniques which can be used to analyse the sample. The central nervous, respiratory and cardiovascular systems are the most frequently studied organ systems, therefore these tissue-types may be requested to develop early screening tools or for mechanistic studies. However, tissues from diverse other organs (e.g., the gastrointestinal tract, liver, kidney, eye) could also be used to investigate or follow up on specific toxicities in those tissues. As first-in-human studies are conducted in healthy volunteers, the tissue from healthy individuals would be most suitable. Tissue from young healthy donors is rare however, with supplies relying on non-disease related post mortem sources. Tissue from the elderly or people with disease can be useful in investigating safety concerns in relation to a comorbid disease. Fresh tissue can be cultured to carry out longitudinal experiments in live cells. However, this requires the infrastructure to be in place to supply tissue quickly from theatre to lab, and the expertise to culture and manipulate the tissue sample. Fixed and frozen samples only present a snapshot of physiology or disease at one timepoint, but can be assessed by a wider range of biochemical, molecular or cytometry techniques. Fixation allows the long-term preservation of tissue sections for future analysis of large patient cohorts. What are the NC3Rs doing to promote human tissue use? 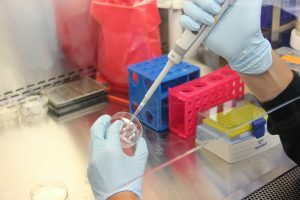 In addition to organising workshops to connect researchers working in the area, the NC3Rs has a number of ongoing initiatives to promote human tissue modelling in research and drug development. The Human Tissue Web Resource on the NC3Rs website has been developed to centralise information and case studies on how human tissue can and is being used for research. A funding highlight notice across all NC3Rs grants in 2017 and CRACK IT open innovation funding has been used to accelerate human tissue use in a range of areas. Human tissue has the potential to improve safety assessment prior to first-in-human studies. While animals will be required for the foreseeable future due to regulatory requirements, investment in development and application of human tissue-based models in this field will demonstrate the extent to which animals can be replaced. By convincing regulators and safety pharmacologists through an evidence base that human tissue studies are robust, the conversation can begin about what role they have in future safety testing. This entry was posted in Events and tagged human tissue, nc3rs, safety. Bookmark the permalink.